The definition of pictures is a compromise between the different screens and the slowest modems. Even so, it can take much time to display enlargements due to their size (100 to 200Ko). Do not hesitate to contact me if you wish to receive a larger picture more precise. The young David sits on a grassy hillock playing a pipe and a bell, looking after sheep and goats. His legendary harp leans against a tree. 23½ carat gold leaf on gum ammoniac. Pigments binded with medieval tempera (gum arabic, egg, honey water). Miniature diveded in two parts. In the first one, the Chist in Majesty is surrounded by the four evangelists. In the second one, the "24" old men are turned towards the Christ while John the visionary is helped up by an angel. The text announce the day of the final fight. 23½ carat gold fluid burnished. 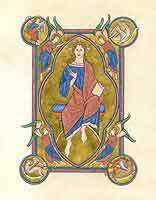 This psalter, illustrating St Matthew, is one of the many works of art ordered by the famous Duke of Berry. The sobriety of the figure, contrasting with the rich oramentations, balances wonderfully the setting. The illumination illustrates a text about a dove and a palm tree. The representation of the palm tree is extremly simplified by a Cross. 23½ carat gold leaf burnished with agate on base. Historical pigments: Lapis-Lazuli, Brasil wood, yellow ochre, ceruse. Two angels are crowning the holy Virgin, queen of heavens. God the Father gives his benediction, holding a globe, symbol of his universal empire. Text extracted from the canticle of the Virgin. Personnal representation of the Virgin and the Child. 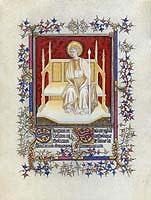 Initial F with miniature inspired of the "Très belles heures du Duc de Berry". 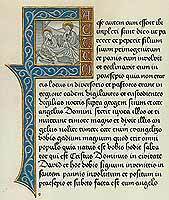 The cursive gothic text is taken from the gospel of St Luke (chapter II). Page of the Aberdeen Bestiary. It represents Christ in majesty, framed by angels and the symbols of the four evangelists. Historical pigments: Lapis-Lazuli, cinnabar, minium, copper acetate, ceruse, brown earth, yellow ochre. The Hours of Anne de bretagne contain an impressive herbarium, illustrating most of the plants of the medieval gardens. We have here, some white violets with a dragonfly. "Mineral" gold fluid from "Laverdure". First page of the Aberdeen Bestiary. 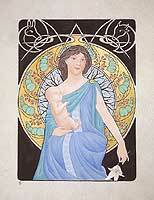 It represents and comments the first day of creation: heaven and earth.